Our friends at COMET TV has another great giveaway for our readers. COMET TV if you are not familiar yet is a Sci-Fi network with both great new and classic content. COMET TV has a whole crop of Future-tastic films for January that will start your New Year out right! Two years after the original Westworld tragedy, The Delos Corporation have reopened a variety of theme parks, but all is not what it seems. In a not-too-distant dystopian future, Max (Mel Gibson), an officer with the Main Force Patrol, launches a personal vendetta against the gang when his wife (Joanne Samuel) and son are hunted down and murdered. In a remake of the 1975 classic, LL Cool J invites viewers to join in the new sport of… Rollerball. It’s a violent extension of roller derby with motorcycles, metal balls and adventure so intense it will cause Chris Klein to flee the country for his life. Young soldiers (Dean Cain, Justin Whalin) become involved in a war that has lasted more than a century. The prize pack features a spaceman USB light. Open the spaceman's visor and he lights up for a fun and unique way to finish up those late night emails, or perhaps watch Comet online! The pack also has some space age goodies including rock candy sticks as well as packs of Pop Rocks! 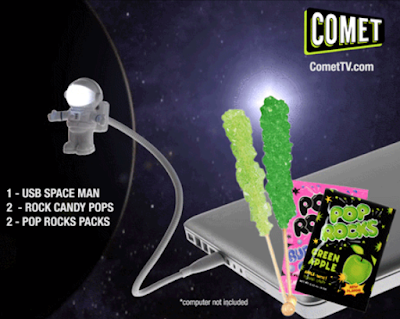 Each household is only eligible to win ONE (1) COMET Space Man Landing Prize Pack via blog reviews and giveaways. Only one entrant per mailing address per giveaway. If you have won the same prize on another blog, you will not be eligible to win it again. Winner is subject to eligibility verification. Contest ends February 8th 2016 midnight ET.